Mardy Collins did it all for PGE Turow Zgorzelec on Wednesday night; he stuffed the stat sheet and made the game-winning jumper in a 79-80 victory at Telent Ostend, which was the team’s third straight win, first on the road this season and took it a step closer to the Eurocup Eighthfinals. 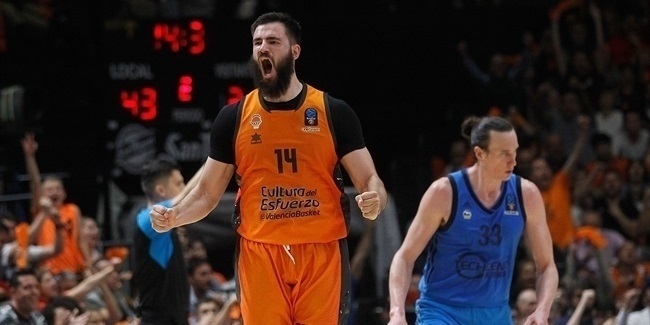 He can celebrate all of that with the knowledge that he is the Eurocup Last 32 Round 4 MVP too. Collins starred with 28 points, 6 rebounds, 7 assists and 3 steals, which gave him a performance index rating of 40. His index rating was not only the highest of any Eurocup player all week, but it tied for the highest in the competition this season. Bobby Dixon of Pinar Karsiyaka Izmir and Marius Runkauskas of CSU Asesoft Ploiesti tied for the second-highest index rating of Last 32 Round 4 with 35. Dixon flirted with a triple-double with 16 points, 9 rebounds, 11 assists and 3 steals as Karsiyaka stopped Paris Levallois 86-79. 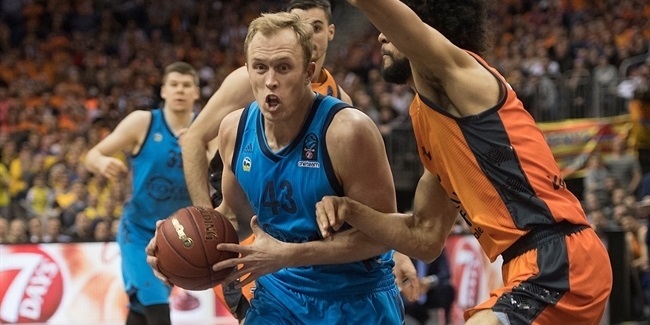 Runkauskas put up 25 points on 6-of-7 three-point shooting, 8 assists and 3 steals in an 84-100 loss to Valencia Basket. Wrapping up the week’s top five performers were E.J. Rowland of Banvit Bandirma and Darius Johnson-Odom of FoxTown Cantu. 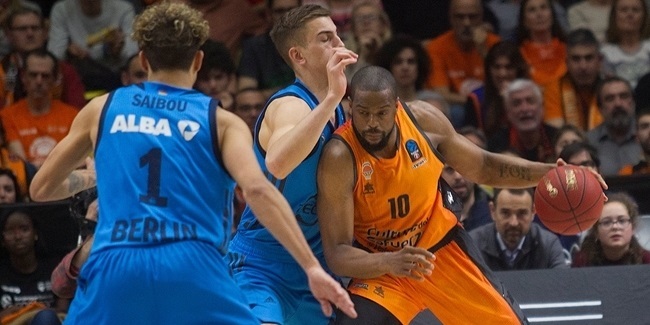 Rowland scored 21 points, dished 5 assists and drew 9 fouls for a 33 index in a 91-80 loss at Herbalife Gran Canaria Las Palmas. Johnson-Odom posted a 32 index after going for 24 points, 8 rebounds and 4 steals in a 68-57 win over Limoges CSP. Krasny Oktyabr Volgograd guard Randy Culpepper was Last 32 Round 4’s best scorer with 31 points in a road win at CAI Zaragoza. He climbed to third in the Last 32 with an average of 19.3 points per game. Rakim Sanders of Dinamo Banco di Sardegna Sassari is the Last 32 leader with 19.7 points per game. Another Krasny Oktyabr player, big man Romeo Travis, led all players in rebounding this week with 14. His 8.8 rebounds per game are tied for fifth in the Last 32; Anthony Randolph of Lokomotiv Kuban tops the Last 32 charts with 11 per game. Dixon’s 11 assists were the week’s high mark; his 7.3 assists per game are tied for second in the Last 32 behind only Erwin Walker (7.8 apg.) of JDA Dijon. Lokomotiv’s Malcolm Delaney topped the weekly charts with 5 steals. Evangelos Margaritis of PAOK Thessaloniki is averaging the most steals in the Last 32 with 3 per game. Four players tied for the Last 32 Round 4 high mark in blocks with 3 each: Richard Hendrix of Lokomotiv, Hilton Armstrong of Besiktas IF, DaJuan Summer of Gran Canaria and Shane Lawal of Dinamo Sassari. Lawal’s 2.3 blocks per game lead the Last 32.